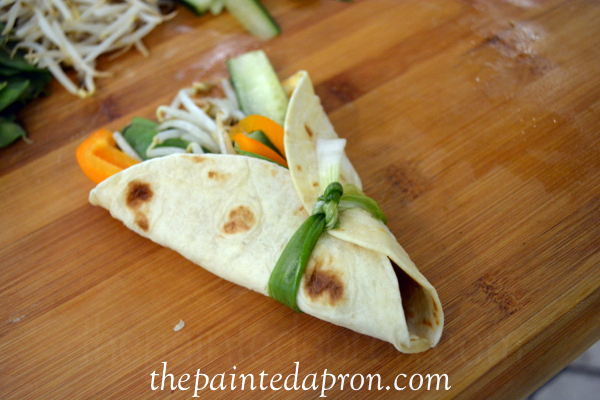 Here’s what I love about spring rolls~ the fresh vegetables and wonderful colors peaking through the transparent paper wrapper. 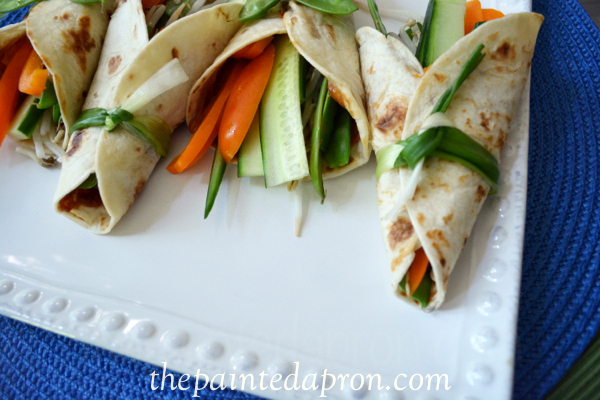 These can be assembled ahead of time, and they are fabulous leftover. They will keep for 2-3 days wrapped in saran and stored in refrigerator. 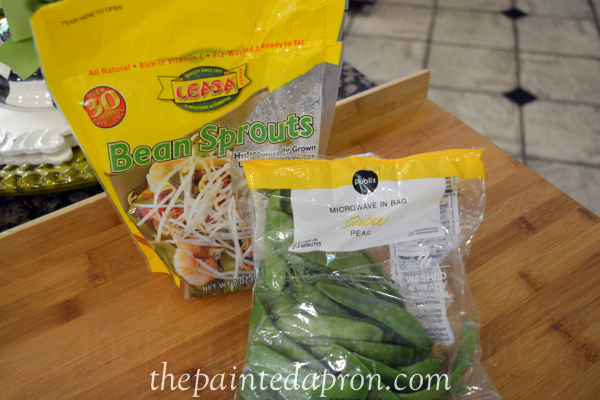 Steam peas and sprouts in the microwave 1-2 minutes until just crisp tender. 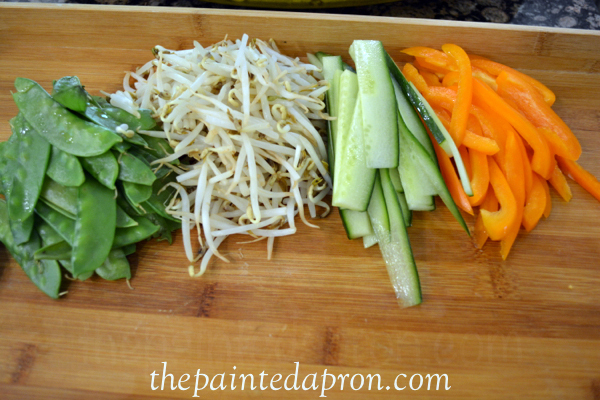 Cut pepper and cucumber into long thin pieces. Combine ingredients in a small bowl, and stir well to combine. TASTE a little with the tip of a spoon and adjust flavors. To add more heat sprinkle in a scant amount of red pepper. Oh, by the way, this is one of those recipes that WILL make you a rock star!! I made egg rolls yesterday! 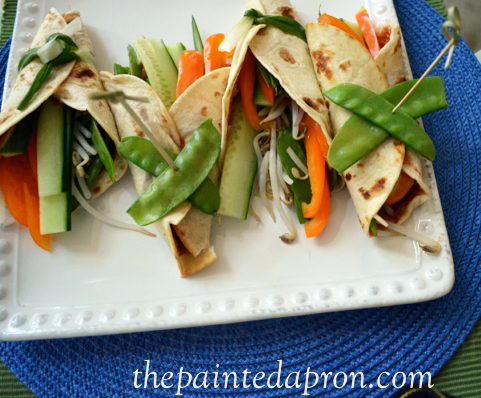 Only mine were deep fat fried and not quite as healthy as your spring rolls:@) Love the pretty colors and fresh snow peas! Not only tasty, but pretty too! This looks like a pretty bouquet of flowers! 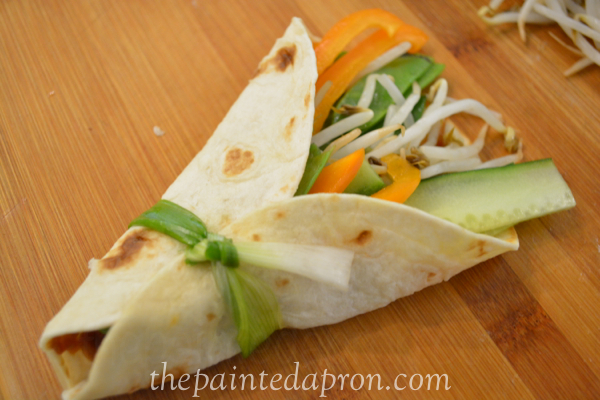 I make spring rolls with the traditional clear rice papers, but they are always flavorless and “gummy.” Using the tortilla with the spread may be the trick I need! 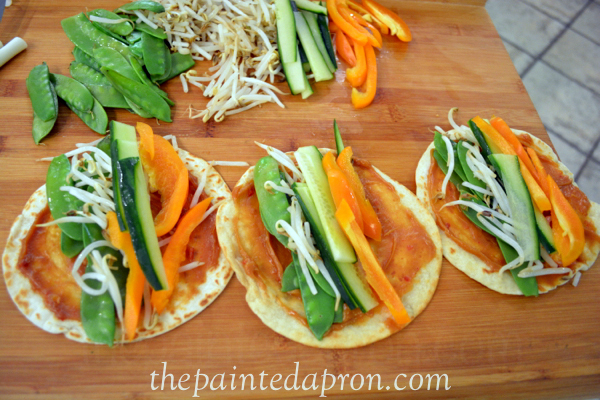 I never thought of subbing tortillas for the rice wraps. I have an overload of tortillas right now so why not give this a try! I’ve not found much I don’t like with tortillas. Soooo happy to have found this recipe. 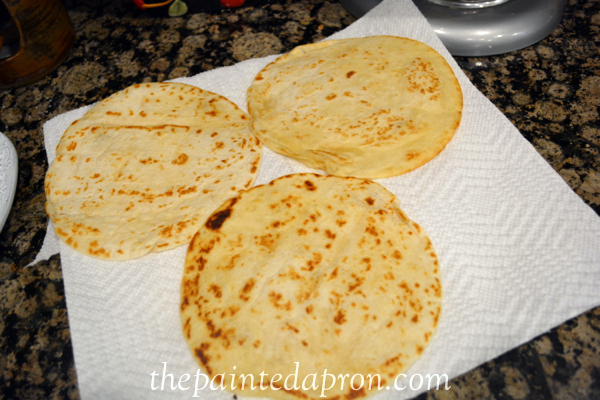 The mister came home with a GIANT sack of flour tortillas, and I just had no clue what all I was going to do with them, particularly since I never really thought he liked them. This is such a great idea, and looks so delicious. Thank you, thank you, thank you!! Thank you Pattie, I ate this all week for lunch, they were so good, I hope you enjoy! YUMMY! 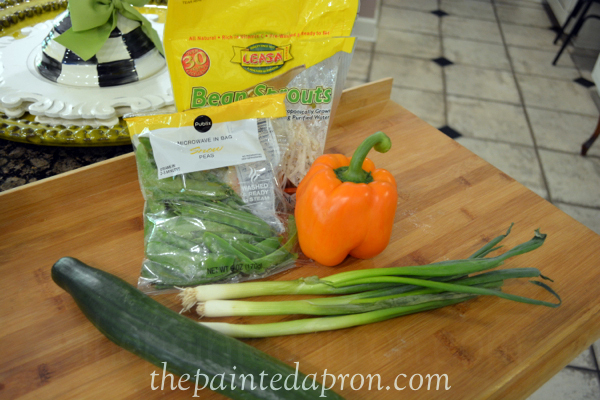 Great recipe as the weather gets warmer and the veggies are fresh in my garden! Thanks for sharing at THE SCOOP! How cute are these? 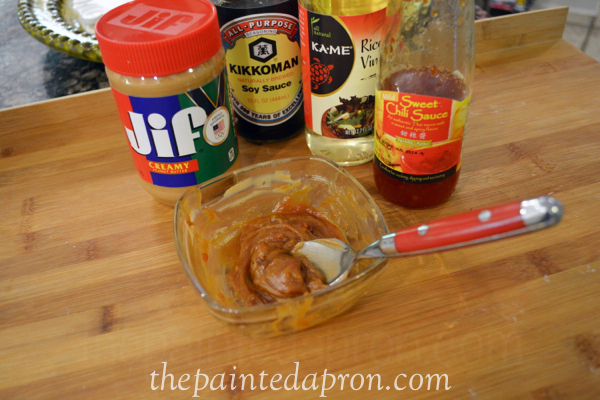 In my book anything with peanut sauce is a winner! Thanks for sharing. 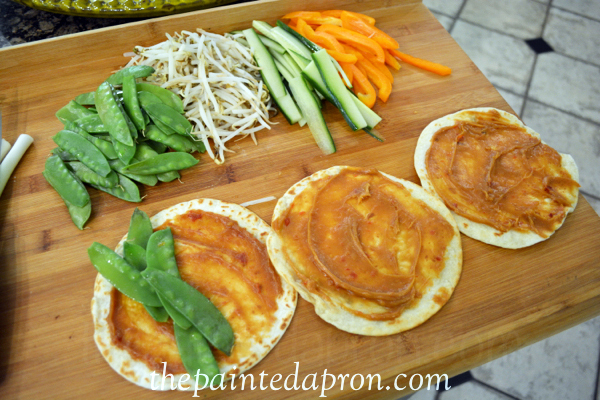 You are so welcome, this is going to be a summer staple at our house! These look super delicious and I love the way you tied them shut! I’ve never thought to use a green onion as a tie, but I have plenty of them. I can’t wait to try these! These look fantastic!! How fun for a luncheon. 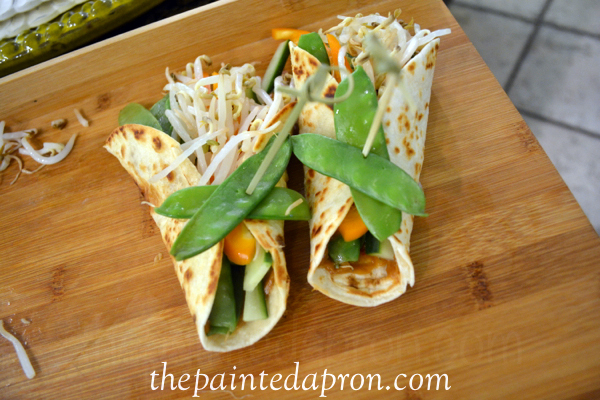 I love the veggie combination and the paste that you are using for your great Spring Rolls, they look delicious! 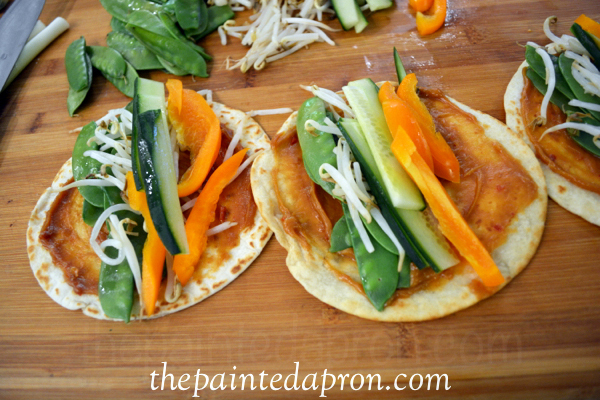 Thanks so much for sharing this awesome recipe with Full Plate Thursday, I will be pinning this one. Hope you are having a great weekend and come back to see us real soon!